Vilas County is located in North Central WI between Rhinelander and Upper Peninsula of Michigan on the northern middle part of the state along the Michigan border. 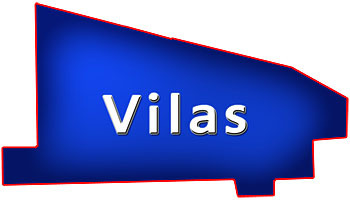 Vilas is known for its 1,300+ lakes, fishing, bird watching, farmers markets, biking, camping, golfing, hiking, boating, canoeing, kayaking, snowmobiling, cross country skiing, which also has Mary Lake State Natural Area, Papoose Creek Pines State Natural Area, Headwater Lakes State Natural Area, Northern Highland State Forest, North Twin Lakes, Trout Lake, Fence Lake, Big Sand Lake plus a couple communities including; Presque Isle, Manitowish Waters, Sayner, Phelps, Conover, Land O Lakes, Eagle River, St Germain and Boulder Junction. It's surrounded by 4 other Counties; Iron, Price, Oneida and Forest. On this site you can search for Hobby Farmettes, Fish Farms, Tillable, Dairy Farms, Sustainable Agriculture, Ag Land for Sale, Small Farm Acreage, Cropland, Barns, Ranches for Rent, Horse Pasture, Organic Farming and more located in this county listed by a real estate agents. Vilas County, Wisconsin GIS MAP Information!